Intelligent Hembar Alignment (IHA) offers superior precision alignment. Shades track together and stop at programmable preset positions within 1/8” of each other at all time. IHA maintains design intent and provides a clean aesthetic from the building exterior. Design shading solution as a part of the facade and window system to balance building performance and aesthetics. Variety of fabrics in different colors, textures, and weaves makes it easy to choose the right shade for your application. Lutron has a variety of controls available in different colors, finishes, and configurations to complement any décor. Daylight glare can cause significant eyestrain and discomfort. 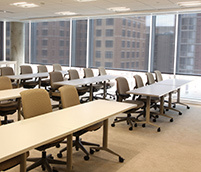 Occupant productivity can be greatly decreased if glare is not properly controlled. * In commercial buildings, the cost of occupants' salary and benefits is often 100x more expensive than total building energy cost. Control glare without compromising aesthetics and views. 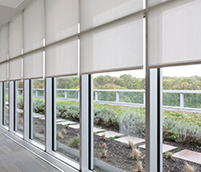 The right fabric can greatly reduce or eliminate glare independent of manual, motorized, or automated shade control. Lutron’s Performance Shading Advisor can estimate your glare probability. * Heschong Mahone Group, Inc., 2003. 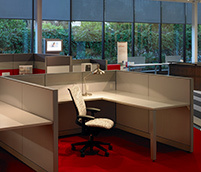 Windows and Offices: A study of office worker performance and the indoor environment. Prepared for California Energy Commission. 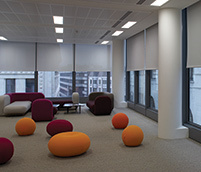 Lutron Hyperion Automated Shades double the useful daylight zone in commercial offices. 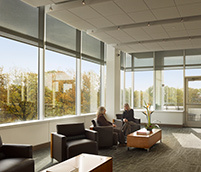 * Purdue University (2010) conducted daylight harvesting simulations for a typical private office with different window to wall ratios and shade fabrics to show the benefit of Lutron Hyperion software. View preservation is the ability to maintain exterior views to provide occupants with a connection to the outdoors. Providing a general connection to outdoors through views can cause an improvement in productivity, mood, and well-being. Without consideration during shading system design, these views will not be utilized effectively. 1. Opening the shades more often for unobstructed views. Lutron’s solar adaptive shading keeps the shades open when conditions are comfortable. 2. Choose from diverse fabric options that preserve views when closed. Without a solar barrier, radiant heat from direct sun, as well as the warm glass, can make occupants feel much warmer than the interior room temperature would indicate. Shades can be specified with high Solar Reflectance (Rs) values to improve thermal comfort.